Data released showed factory output at 0.1% in February, against 1.4% in the previous month and retail inflation accelerating 2.86% in March from 2.57% a month ago. The Reserve Bank of India cut the policy rate by 25 basis points for the second consecutive time earlier this month as concerns over growth loomed larger than those surrounding inflation. 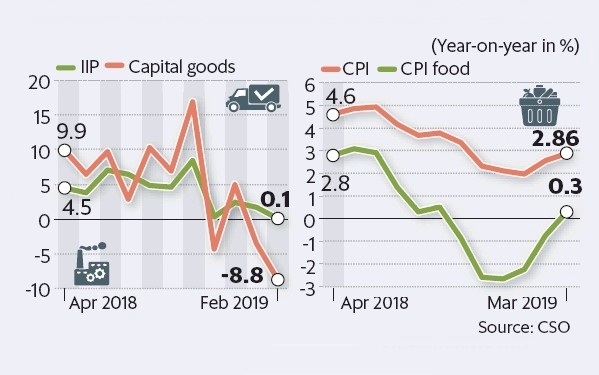 Retail inflation picked up in March as food inflation turned positive at 0.3% after five consecutive months of contraction. However, services inflation, which includes items such as health, education, and recreation, remained elevated at 5.68% during the month. The Index of Industrial Production remained flat in February on the back of a contraction in manufacturing output, while growth in mining and electricity output remained in low single digits. Capital goods contracted (-0.3%) for the third time in the last four months, signalling an uncertain future for investment revival. The IIP data shows that the growth slump is persisting with manufacturing being the worst hit segment. The Indian economy grew 6.6% in the December quarter, the slowest in five quarters, prompting the Central Statistics Office to trim its 2018-19 forecast to 7% in February from the 7.2% estimated in the previous month. Of the other high-frequency indicators, data released by the Society of Indian Automobile Manufacturers on Monday signalled a slowdown in urban demand as car sales grew 2.7% in 2018-19, the worst performance in five financial years. The International Monetary Fund on Tuesday cut India’s gross domestic product growth forecast for 2019-20 by 20 bps to 7.3%, following similar action by the Asian Development Bank and the RBI. 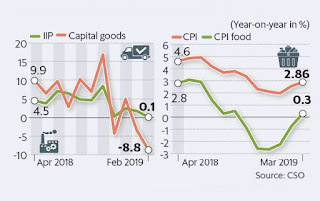 With the economy projected to slow down in the fourth quarter, RBI’s focus has shifted from inflationary concerns to sustaining the growth momentum since its February policy review, when it began cutting the repo rate and changed its stance to neutral from calibrated tightening.